Tommy Orange’s “groundbreaking, extraordinary” (The New York Times) There There is the “brilliant, propulsive” (People Magazine) story of twelve unforgettable characters, Urban Indians living in Oakland, California, who converge and collide on one fateful day. It’s “the year’s most galvanizing debut novel” (Entertainment Weekly). As we learn the reasons that each person is attending the Big Oakland Powwow—some generous, some fearful, some joyful, some violent—momentum builds toward a shocking yet inevitable conclusion that changes everything. Jacquie Red Feather is newly sober and trying to make it back to the family she left behind in shame. Dene Oxendene is pulling his life back together after his uncle’s death and has come to work at the powwow to honor his uncle’s memory. Opal Viola Victoria Bear Shield has come to watch her nephew Orvil, who has taught himself traditional Indian dance through YouTube videos and will to perform in public for the very first time. There will be glorious communion, and a spectacle of sacred tradition and pageantry. And there will be sacrifice, and heroism, and loss. There There is a wondrous and shattering portrait of an America few of us have ever seen. It’s “masterful . . . white-hot . . . devastating” (The Washington Post) at the same time as it is fierce, funny, suspenseful, thoroughly modern, and impossible to put down. Here is a voice we have never heard—a voice full of poetry and rage, exploding onto the page with urgency and force. Tommy Orange has written a stunning novel that grapples with a complex and painful history, with an inheritance of beauty and profound spirituality, and with a plague of addiction, abuse, and suicide. This is the book that everyone is talking about right now, and it’s destined to be a classic. TOMMY ORANGE is a recent graduate from the MFA program at the Institute of American Indian Arts. He is a 2014 MacDowell Fellow, and a 2016 Writing by Writers Fellow. He is an enrolled member of the Cheyenne and Arapaho Tribes of Oklahoma. He was born and raised in Oakland, California, and currently lives in Angels Camp, California. "A new kind of American epic... one that reflects his ambivalence and the complexity of [Orange's] upbringing." "Masterful. White-hot. A devastating debut novel." 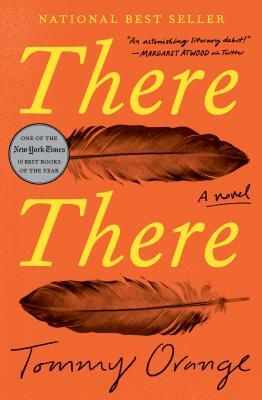 "A gripping deep dive into urban indigenous community in California: an astonishing literary debut!" "This is Tommy Orange. Remember his name. His book's gonna blow the roof off." "A symphonic debut...Engrossing... There There introduces an exciting voice." "Commanding...The propulsion of both the overall narrative and its players are breathtaking as Orange unpacks how decisions of the past mold the present, resulting in a haunting and gripping story." "Visceral... A chronicle of domestic violence, alcoholism, addiction, and pain, the book reveals the perseverance and spirit of the characters... Unflinching candor... Highly recommended." "Kaleidoscopic... In this vivid and moving book, Orange articulates the challenges and complexities not only of Native Americans, but also of America itself."